John Deere was an American blacksmith who founded the “Deere & Company” which is now one of the largest equipment manufacturers in the world. Deere was born February 7, 1804, in Vermont, the third son of William and Sarah Deere. William left for England in 1808 but was never seen or heard from again. He presumably died during the journey or may have abandoned his family. In any case, John was raised by his mother and was only given a rudimentary education due to the family’s insufficient income. At the age of 17, he became an apprentice to a prosperous blacksmith named Captain Benjamin Lawrence and in 1825, at the age of 21, he set up his own business. In 1836 Deere moved to Grand Detour, Illinois to look for business prospects, and his family soon followed suit. Here he found plenty of work and settled down, quite content with business prospects. Deere noticed that cast iron plows being used at the time often came to him for repairs and he realized that they did not work very well in the prairie soil. Deere recognized a business opportunity that would make the farmers’ lives much easier. He produced the first plow using a broken saw blade and found that it worked very well with the thick soil. Demand was slow at first; in the first year, that is, 1838, he sold three plows. The next year he sold ten, and the year after that he sold forty. In 1841 he successfully sold 100 plows and realized that he needed to expand the business. With this in mind, he entered into a partnership with Leonard Andrus. The business began to expand and continued to prosper along with the steadily rising demand for Deere’s equipment. By 1846 the two were producing nearly a 1000 plows a year. 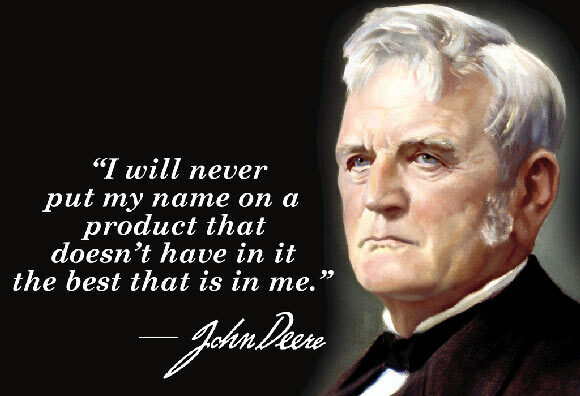 Despite the business’ growing success, Deere disbanded the partnership in 1848. He sold his share of the business to Andrus and moved to Moline, Illinois which was located on the Mississippi River and where there was better availability of transport and raw materials. His business prospered here as well, and in 1850 he was producing more than 1600 plows a year. He also started manufacturing and selling other agricultural equipment along with plows. He began to import British steel to keep up with the rising demand but later got the steel plates needed for plow production made locally from Pittsburgh manufacturers in order to avoid the hassle of importing raw materials. By 1855, Deere’s factory was selling more than 10,000 plows a year. These famously came to be known as “The Plow that Broke the Plains”. Deere’s success is celebrated by a commemorative plaque in Middlebury, Vermont at the shop where he learnt the blacksmith trade. Deere was married twice, first to Demarius Lamb, in January 1827 with whom he had five children. After Demarius’ death, he married Lucinda Lamb in June 1867 and had four children with her. After his retirement from business in 1858, he transferred the leadership and management to his son Charles, naming him the Vice President. He retained the title of President but was not actively involved in running the company. The company was officially incorporated as Deere & Company in 1868. After informally retiring, Deere turned his attention to politics and society. He served as the mayor of Moline for two years, founded the National Bank of Moline and was an active member of the church. He died on May 17, 1886. Since his death, his company has continued to prosper and has expanded globally. It is now one of the largest agricultural and industrial equipment manufacturers in the world.